Call of the Wild is the story of Buck, a magnificent dog who is stolen from his idyllic life and sold for use on a Yukon dogsled team. His travels are not only of a physical nature, as he learns hard discipline from men who must discipline their dog teams, but his own journey back to his primordial roots in the frozen tundra - the roots of wolf. This amazing story of transformation is beautifully written and provides a glimpse of the hard life in the Yukon Territory during the 1900s. 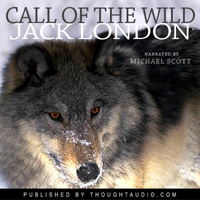 Written from the viewpoint of Buck, the dog, nobody delves into the canine mind better than Jack London during a time when Yukon gold lured men into the frozen northwest. Exceptional tale. Now I know why this book has been so popular for so many years. Well worth the read. I remember reading a book back at school from the animals viewpoint and got badly put off but you'd is excellent. Great book. Great Narrator. I enjoyed it very much.